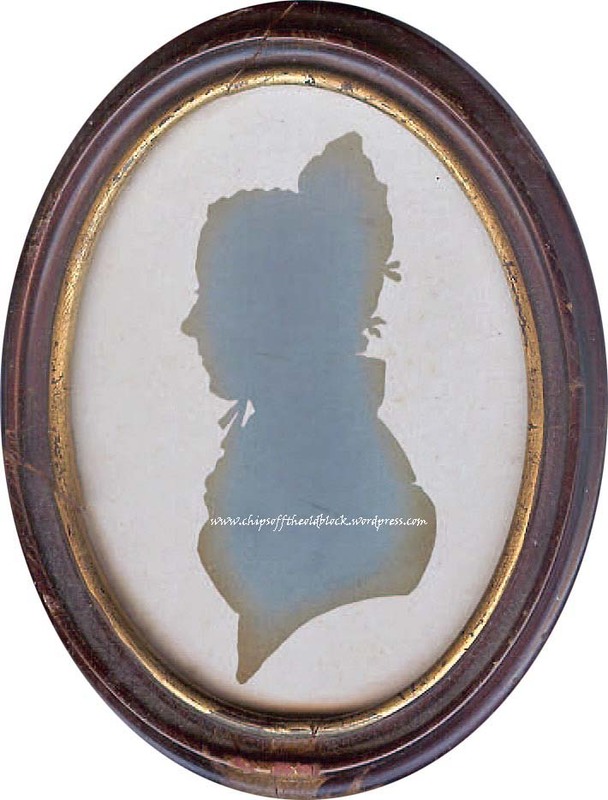 Well, still looking for the “Pitt connection” mentioned in the last post, but it does seem highly likely that the previously unnamed sitter for this old silhouette was indeed Martha Nunn Capon, my 4th great grandmother and Mary Capon Wills’ mother. I’m pleased because this is the farthest I’ve managed to get back on my maternal line, and this discovery coincides with another one: that genetically, my maternal line is haploid group ‘V’, a subgroup of ‘R0‘. Coincidentally, Benjamin Franklin and Bono are also “Vs”. According to information provided by http://www.23andme.com, the company through which I had my DNA test, this group “originated in Iberia during the Ice Age. 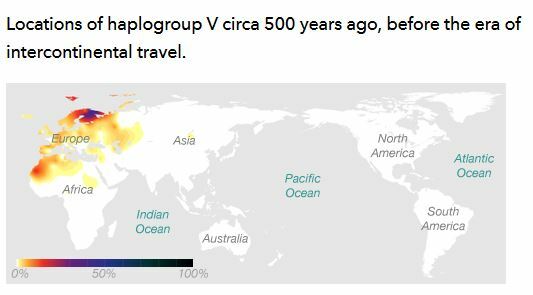 After a last burst of cold conditions roughly 12,000 years ago, migrations carried the haplogroup northward along the Atlantic coast and through central Europe to Scandinavia. 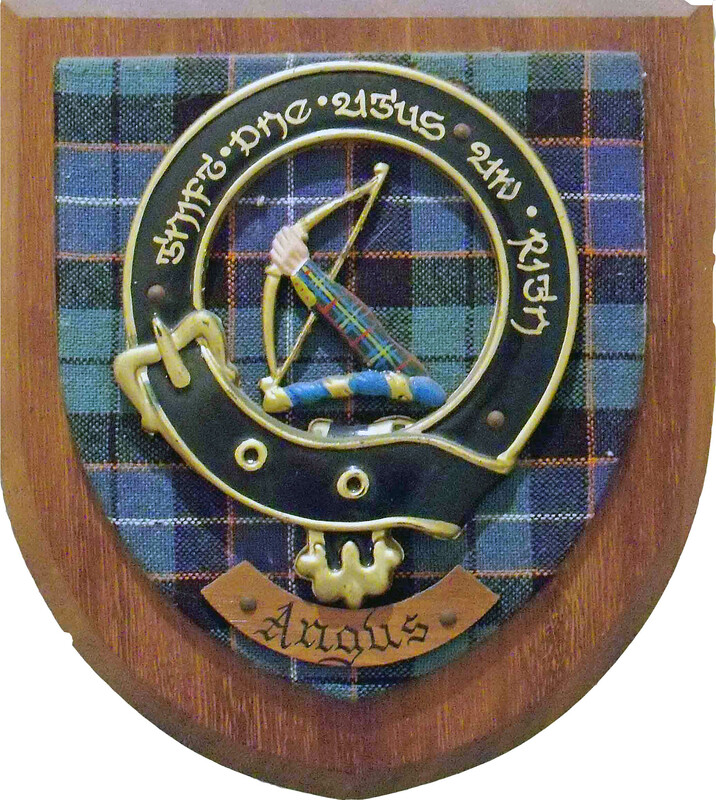 Today it is found in a wide variety of populations from the Basques of Spain to the Saami of Finland”. While I’d always known of my predominantly English, Irish, Dutch, and to a lesser extent German and French ancestry, I could never have imagined that I could have ancestry from Spain or be genetically linked to the Saami. The amount of information you receive from 23andme on your ancestry is actually quite overwhelming, especially when it comes to deciphering the “lingo” and digesting the list of those genetically related to you. However, none of the 750+ people listed are closer than 3rd-6th cousins. 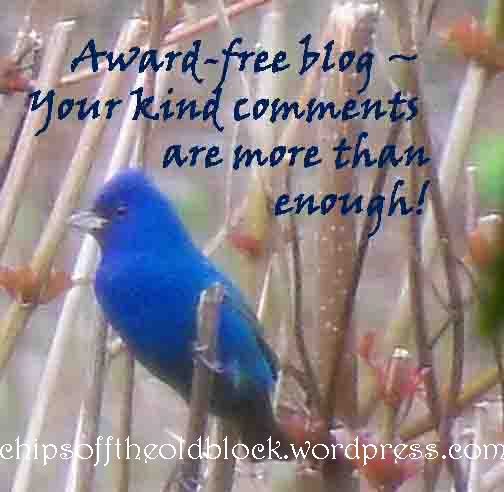 I’m hesitant to start sharing information with people until I have a full grasp of what I am sharing. Hopefully, some day, some closer connections will present themselves. And, by then, I hope I will understand all this a bit better! I might add that the health information–both the positive and the negative–is also definitely worth having. Definitely take advantage of the $99 offer if you are even mildly interested. You really do find out an extraordinary amount of information. 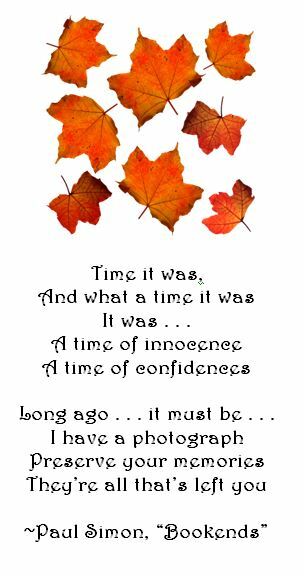 You may even have, as I did, some “a-ha” moments. While reading through some of my genetic traits, I could not help but react with a few “a-ha”s like having a high tolerance of caffeine. Apparently the V group is relatively rare, found in just about 4% of Europeans, with the biggest concentration in Scandinavia with the Saami (59%). 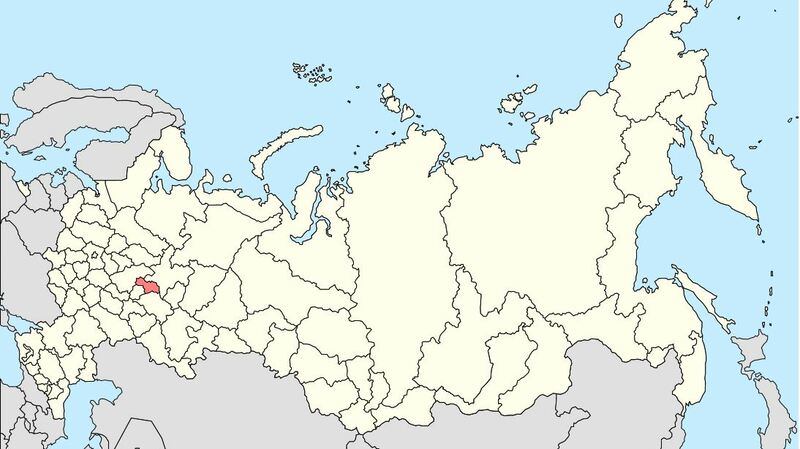 One other thing that kind of blows my mind as someone who spent a lot of time studying, working, and living in Russia: about 10% of the Mari people of the Volga-Ural region are group V. I actually almost ended up in the vicinity of the Mari who are to the north of the city of Kazan. In the early 1990s, when buying a train ticket to visit friends in Ryazan (3 hours to the southeast of Moscow), the ticket seller thought I said “Kazan” (some 11 hrs to the east). I did not scrutinize my ticket until just before I was leaving. Nor did I scrutinize the price since back then travel was extremely inexpensive by world standards; thankfully I realized the mistake before I boarded the train—an 11 hour train ride would have been quite a rude awakening to say the least. 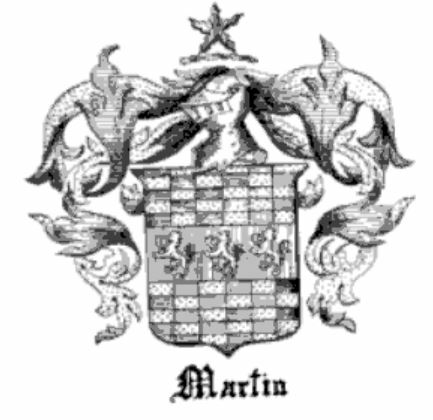 Now, 20+ years later, I’d actually quite like to go east to visit the home of the Mari. It’s a funny old world, isn’t it? The reason I picked up the LaBar book, The Reminiscences of George La Bar, the Centenarian of Monroe County, PA., Who Is Still Living In His 107th Year! by A. 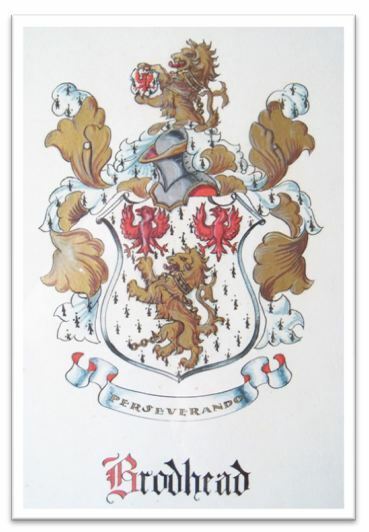 B. Burrell, which was introduced in the previous post, was because it contained a few references to the Brodheads–as one might expect given their shared early-settler status. The LaBar family is fortunate to have such a wonderful record from that era in their history. 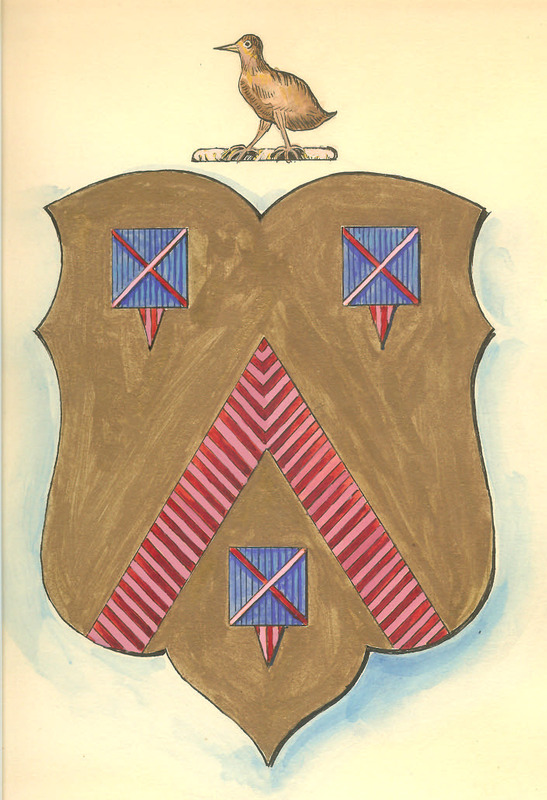 We do know from George’s book that Ben Franklin came in contact with the Minisink Valley Brodheads, and we have evidence of the courtship taking place between Daniel Brodhead (the future Brigadier General, son of Daniel Brodhead and Hester Wyngart) and Elizabeth DePui (Samuel DePui’s daughter), who were married in 1756 when he was 20, and she was 17. 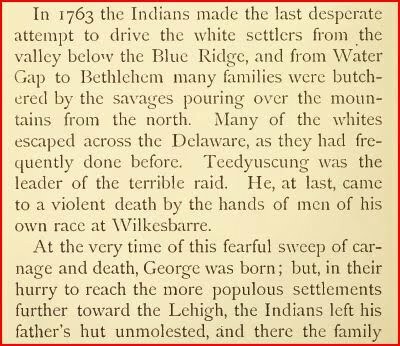 You may recall that it was in 1755 that the Indians’ rampage against the settlers began. That December (10th) they attacked the Brodhead house. Daniel Brodhead Sr. and his sons and daughter repelled the attack, but the Indians went elsewhere, attacking and destroying many settlers. Five hundred troops were sent to the area immediately, to protect the survivors. 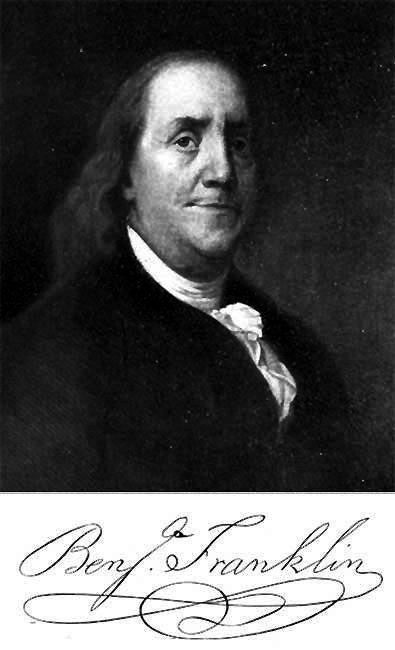 Benjamin Franklin (in his late 40s at the time) was commissioned by the Governor to oversee the construction of fortresses in the region and direct all operations. He arrived in Bethlehem eight days after the rampage to begin his work. I’m not sure when exactly the following took place, since it’s referred to only as being “early in the Indian Wars”, but at some other point, the Governor sent Franklin to go from fort to fort to pay the troops stationed there. Franklin was to report back his observations. At one point per the LaBar book, Franklin stops by Nicholas DePui’s and while there, “a young Brodhead, son of Daniel, was ‘sparking’ the old man’s daughter, and as he (Brodhead son) was a frontier man, he thought the Colony owed him services, as well as the more idle soldiers. Franklin denied the claim, saying it was unnecessary for a man to stand guard over a a woman who lived in a fort.” I assume “sparking” meant flirting. 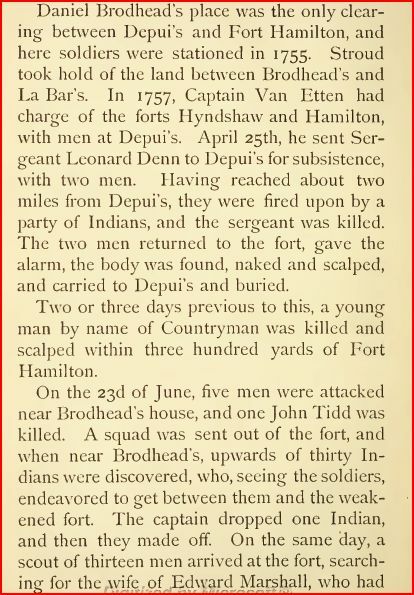 LaBar’s book also mentions the 389 troops positioned in Northampton Co. in 1758. 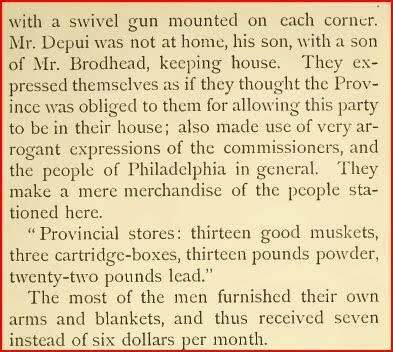 On page 16 we read that 26 troops under the command of Lieutenant Wetherhold were positioned at the Brodhead house. As an interesting aside, on page 17 we learn that on 6/21/1757, Samuel DePui’s ailing wife (who by then was Daniel Brodhead Jr.’s mother-in-law) was escorted by troops to a doctor in Bethlehem. 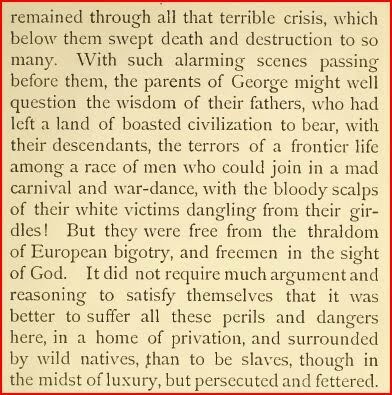 In 1763, the year George LaBar was born, the book notes the below (pp. 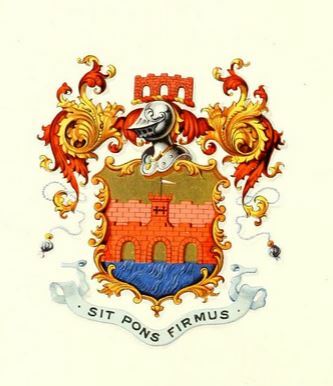 18-19). I’ll finish this post here, but, hopefully I’ve whetted your appetite to read the LaBar book in full. It is a source of great information–in spite of the fact that the author admits that George’s memory for dates was rather unreliable at 107. And to think he survived another five years–amazing!